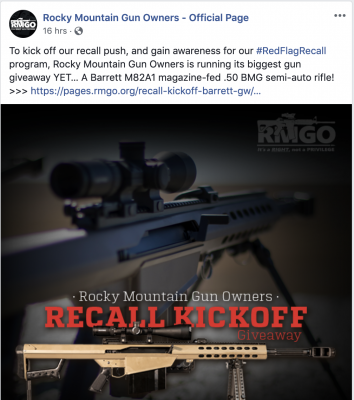 If you want to start amassing guns, you might consider attending Republican Party fundraisers in Colorado. 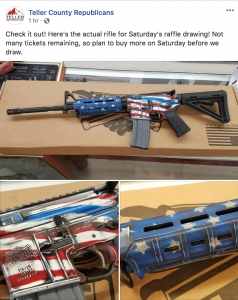 To get your own military-style semi-automatic AR-15 rifle this weekend, you’d have to be lucky (or unlucky if you hate guns), because it’s the grand prize in a Saturday raffle for the Teller County Republican Party. In May, you could have gotten one at a GOP fundraiser in Colorado Springs. The AR-15 is the firearm used at the mass killings of students in Florida this year and Sandy Hook in 2012. it was used in the Las Vegas massacre in 2017 and San Bernadino in 2015. And, unfortunately, elsewhere. Does that bother the organizers of the raffle? Stone said the winner of the raffle will have to pass a background check before receiving his or her grand prize. At a GOP fundraiser in May, your chance to win an AR-15 would probably have been more pricey. 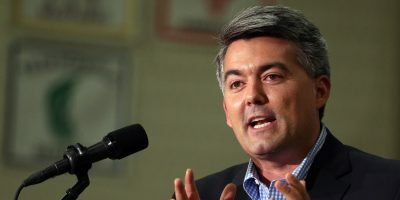 Instead of being raffled off, the weapon was the first of six “live auction items” at the El Paso County Republican Party’s annual fundraiser at the Antlers Hotel in downtown Colorado Springs. The estimated value of the AR-15 for this weekend’s raffle is $1,500. The second prize in the raffle is 10 one-once Liberty Silver Dollars, with a retail value of $200. Money goes to Republican efforts in Teller County, located outside of Colorado Springs. 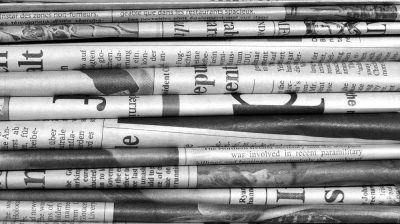 Gun-safety advocates say you don’t need a semi-automatic weapon to kill raccoons or other farm pests. It’s essentially a military weapon, designed for rapid-fire killing, not hunting or other civilian use, they say. This topic contains 0 replies, has 1 voice, and was last updated by Jason Salzman 10 months, 1 week ago.